Content - Ask Alfred: We Are Outdoor Ready…Are You? Ask Alfred: We Are Outdoor Ready…Are You? You many have noticed an increase recently in the number of ADJ products that offer IP-rated protection, which is essentially weather-proofing. This is a direct response to the desire of many of our customers to use their lighting equipment safely outdoors. But what exactly is an IP rating, what do the different numbers mean, and which types of fixtures are appropriate for your particular situation? 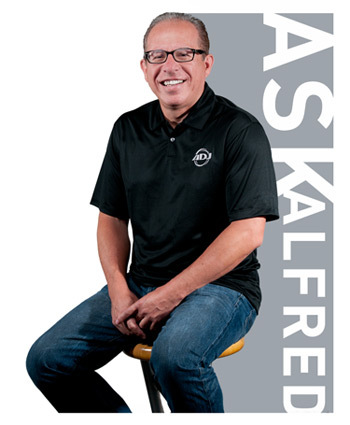 In this installment of Ask Alfred, I’ll answer these questions and also introduce some of the new IP-rated equipment that has recently been added to the ADJ product range. The IP Code, which stands for International Protection or Ingress Protection, is an internationally-recognized standard for the degree of protection offered by a mechanical casing or electrical enclosure. It comprises two numbers; the first relates to a given unit’s protection from solid particles, while the second deals with protection against the ingress of liquid. The standard has 1 – 6 classifications for particle protection and 1 – 9 classifications for liquid protection. However, since this standard covers a wide variety of types and sizes of equipment, not all of these are relevant for lighting equipment. For example, a particle protection rating of 1 denotes that a particular unit is protected from objects larger than 50mm (about 2”), which is a given for all of the products in our range. When it comes to ‘weatherproofing’, it’s mainly the second digit of a particular fixture’s IP-rating that is relevant, as that relates to its protection against rain. However, the first digit – which relates to particle protection – is also worth considering. In addition to rain, equipment used outside may also come into contact with wind, and that wind may well be carrying dust or sand particles – especially if you’re lucky enough to work in beach resorts. The two relevant IP classifications for particle protection are 5 (Dust Protection) and 6 (Dust Tight). Fixtures with an IP-rating that begins with 5 are certified to be protected against dust and other small particles. They may not be designed to completely prevent the ingress of dust, but any small amount that is able to enter will not interfere with the operation of the unit. Fixtures with an IP rating that begins with a 6, however, are certified as completely protected from dust. These fixtures have sealed cases that completely protect their internal mechanisms from dust and other small particles. When it comes to liquid protection – the second digit of an IP rating – the most relevant classifications are 4 (Splashing Water) and 5 (Water Jets). If a fixture has an IP rating ending with 4 it has a case that will protect it from splashes of water from any direction which means that it can be used even when it’s raining. If the fixture has a rating ending in 5 it has been further tested and certified to withstand jets of water coming from any angle. This means that it can be used even in heavy rain or in situations where it may be sprayed with water, perhaps at a pool party. Now that I’ve explained the two different numbers that make up an IP rating, let’s have a look at some specific examples from the ADJ range. 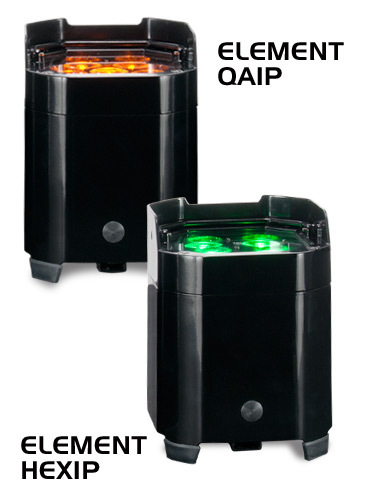 Our new Element Series of portable up-lighters features two IP-rated models, the Element HEXIP and Element QAIP, both of which have an IP54 rating. This means that they are protected from dust and also splashing water, making them suitable for use at temporary outdoor events even if rain is expected. 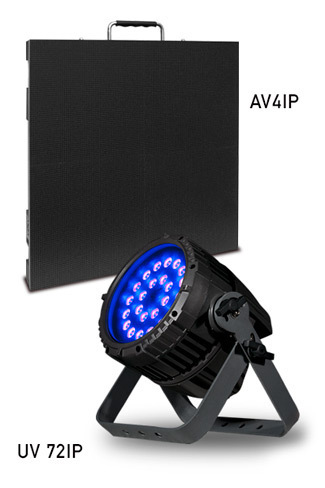 They also have the added advantage of internal rechargeable batteries and built-in WiFLY EXR extended range wireless DMX receivers, which removes the need for an outdoor power supply or signal cables to connect together multiple fixtures. Our new UV 72IP LED-powered UV wash fixture, meanwhile, has an IP65 rating. This means that it is dust tight and protected against jets of water, and is therefore suitable for both temporary events and permanent installation outdoors as it has been built to withstand even heavy rainfall. This fixture – as well as others in the ADJ range – also features weatherproof Seetronic Powerkon power connections and water proof XLR connections which are provided with rubber caps to protect the internal connections from water when not in use. It is also possible for fixtures to have more than one IP rating if they are designed for use in a particular way. For example, ADJ’s new AV4IP LED video panel (coming in September) has an IP65 rating on its front surface and an IP54 rating for its rear panel. This means that it is suitable for all kinds of temporary outdoor events, and can also be used for permanent outdoor installation when the panel is mounted into a structure which provides additional protection for the rear of the fixture from heavy rainfall. As we all know, water and electricity don’t mix, so it can be very dangerous to use lighting equipment outdoors which has not been specifically designed for that purpose. However, with IP-rated fixtures, a whole world of creativity can be opened up allowing lighting effects to be used at outdoor parties and events, even during heavy rainfall. With our growing range of IP-rated fixtures, here at ADJ we’re outdoor ready… are you?